Book Cover: "Published to vast acclaim, this groundbreaking international bestseller lays to rest many myths about the Holocaust: that Germans were ignorant of the mass destruction of Jews, that the killers were all SS men, and that those who slaughtered Jews did so reluctantly. 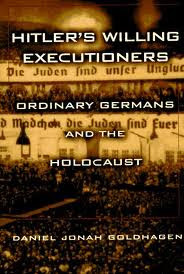 Hitler's Willing Executioners provides conclusive evidence that the extermination of European Jewry engaged the energies and enthusiasm of tens of thousands of ordinary Germans. Daniel Jonah Goldhagen reconstructs the climate of 'eliminationist antisemitism' that made Hitler's pursuit of his genocidal goals possible and the radical persecution of the Jews during the 1930s popular. Drawing on a wealth of unused archival materials, principally the testimony of the killers themselves, he takes us into the killing fields where Germans voluntarily hunted Jews like animals, tortured them wantonly, and then posed cheerfully for snapshots with their victims. From mobile killing units, to the camps, to the death marches, Goldhagen shows how ordinary Germans, nurtured in a society where Jews were seen as unalterably evil and dangerous, willingly followed their beliefs to their logical conclusions." Taryn's Review: If you want to get people riled up and stir up controversy, write about a very sensitive subject. For me, that was one of my biggest issues with Goldhagen's book: he took a very sensitive topic and treated it rather insensitively. What was Goldhagen's thesis (argument)? Goldhagen believed that Germans wanted to slaughter Jews and that Germans looked forward to performing the horrific murders of the Jewish population. Goldhagen argued that his thesis was the simplest answer to why the Holocaust occurred and he feels that historians and other authors have overlooked his angle in their studies. The book explored the police battalions made of "ordinary Germans" which was comprised of middle-aged men who were not part of the SS, Nazi forces, etc. These groups did kill members of the Jewish population. Goldhagen used pictures and testimonies of the men in the police battalions as evidence for his theory. However, it was quite a simplistic leap to say men wanted to kill their their Jewish counterparts. Hopefully none of my readers will never have to endure anything like the psychological torment and emotional hardship that WWII brought about many groups of people, from Germans to Jews alike. I refuse to accept the notion that all Germans wanted to participate in mass killings. Was a choice given to not participate in the killings? Goldhagen said yes and had testimonies of some men choosing not to take part. Another testimony from a man said he didn't want to kill, but didn't want to look like a coward in front of his peers. It was such a complex situation, but Goldhagen made it sound as if this his answer the only possible answer. Goldhagen also ignored those who did grow up in the antisemitic German world who helped save Jews and protect them to the best of their abilities by risking their own lives. Antisemitism did exist, yes. But Goldhagen's sources were also used by another historian who criticized the way Goldhagen presented them. That historian produced a book with the same evidence but came to a very different conclusion. Goldhagen's book did present some very gruesome context for what happened between the police battalions and Jews and it was difficult to read; the pictures are hard to look at as well. Ultimately, I don't agree with Goldhagen's thesis (and it seemed very few in my program did either, including others who work predominately on WWII in Germany, Russia, etc.). It created controversy and stirred up debate. WWII buffs might love or hate it, and would probably benefit either way from reading it. It's a big book and one to take your time reading. I cried a few times reading this book because it's heavy on the soul.